This is a well maintained, super clean 2 bedroom/2 bathroom condo in gated Lake Marion Golf Resort communuity located in Kissimmee. The community is quiet and peaceful on serene Lake Marion. 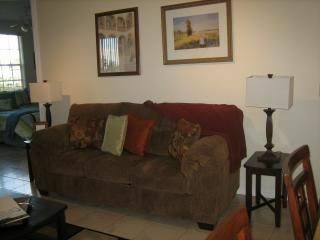 The condo is fully furnished and appointed to accomodate 4. A portable crib is available upon request. Lake Marion Golf Resort is away from the hustle and bustle of the surronding area theme parks. However, within 30 minutes you can reach the Orlando area theme parks. - Disney World, Universal Studio, Magic Kingdom etc. We really enjoyed our vacation, this unit has everything you need and it's beautiful! Angela is a wonderful owner and this is our 3rd time staying here at Lake Marion. We enjoy all the amenities here and have made lifelong friendships with owners and the snowbirds and consider this #1for favorite spots! Was pleased with our stay and loved the hot tub. Many thanks for your review Kathy. We enjoyed having you as a guest and look forward to hosting you again. Angela’s property was very clean and comfortable. I enjoyed relaxing by the pool. Thank you! Angela’s place worked out well for me. I was able to meet family in Disney area for a fun, yet hectic day and then return each night to Angela’s quiet and comfortable unit for a great night’s sleep. I really appreciated having a washer and dryer right in the unit so I could get my clothes cleaned and ready for the next leg of my trip. Thank you for your great review Sandra. We too loved having you as a guest. You were awesome caring for the unit as if it was your very own. The caretakers commented on the cleanliness when you checked out. We would love all of our guests to take care of the unit just like you did!!! Thank you and come back soon! Thank you very much for your great review. You were an awesome guest! You kept the condo clean and followed all house rules. I look forward to having you again. Thanks for your patronage! We are repeat renters,we really enjoy the snowbirds who come every year. We were also surprised to see lights at the pool for evening swims! I flew in from overseas and it was really hard to find a place to stay because of the Holidays. I enjoyed staying here .I wish I could stay longer but other people already booked it.Thank you for letting me stay at your place. Happy Holidays. Nightly Rate: $55 - $60 Weekly Rate: $385 - $420 Monthly Rate: $1200 - $1540 Minimum rates are April - November. Maximum rates are for Thanksgiving and Christmas holidays, January - March. Rates are discounted for 1 or more months.